Bob: I was just reading the most recent Croquet News from USCA and noticed the increased coverage of 9 wicket. 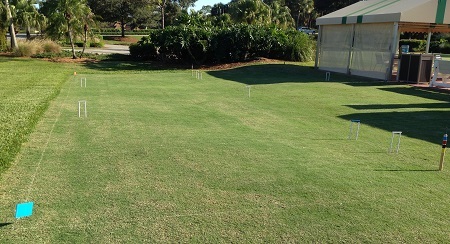 We just added a small 9 wicket court (30 X 60) to our four GC/6 wicket lawn. It’s on Celebration grass rather than putting green grass, and we retained the “natural” sloping topography. 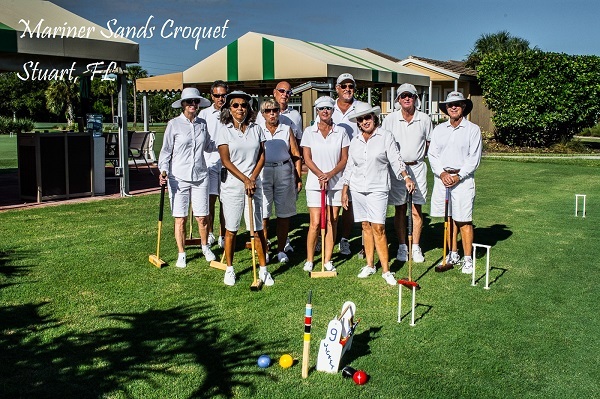 As the Club Croquet chair, and by my nature, I’m interested in getting as many of our members involved in 9 wicket. My first step has been to get a regular group to play weekly. In addition we will have a 9/6 wicket clinic in January to go along with a GC clinic. The GC will “sell out”; the other probably won’t. Bill Mead of NCC is teaching the clinics. 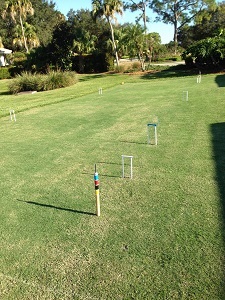 Michael: 9 wicket is the croquet game most people are familiar with here in America. So it’s a good starter and a comfortable place to go back to when teaching split shots( AKA foot roquets) and break play. But it is as difficult as American 6 wicket. Bob: Our players are 90% GC…so the challenge is to introduce them to the variety of shots and break play to try to migrate more of them towards 6 wicket for which we have very few interested players at the moment. I figured that if we could get some of them interested in the shot-making (split, roll(s)) and let them have fun, maybe they’ll want to try the more challenging aspects of 6 wicket. Does this change your strategy for us at all? BTW, we have children/grandchildren visiting here from the cold North over the winter and this will be a venue for them to have fun with us while they’re here. Michael: 9 wicket is a great way to teach break play because the wickets are close. I suggest you only use it as a familiar starting place but move over to GC. When you introduce break play and split shots, set up a 9 wicket court on the short grass. Once everyone gets the idea, go back to the 6 wicket American game. They will go back to 9 wicket with a new appreciation when they play in the backyard. A good small court with a roll up on the East side of the court. The boundaries are optional when playing on this scale. The fun is in moving the balls. Moving one ball is good, but moving two balls at once is a treat, especially if you get them to go where you want. So teaching simple hand/foot roquets and split shots is a big part of the fun. Michael:This looks like a great place for backyard croquet! My advice is to space the peg and paired wickets at least 4 feet apart. You need the space between the peg and 1st wicket(ball placed half way between) to swing the mallet; 1st and 2nd to make the game a bit of a challenge. I’d also bring in the side wickets, 3 & 5; 3 back & 5 back 4 feet from the ‘boundary’. I would not impose out of bounds rules. For the guys who remember that they used to “fire” the opponents ball into the woods, the will quickly learn that all that effort resulted in the ball being placed back in the court and they did not advance. Last, I would suggest Partner Ball rather than CutThroat(everyone for themselves) because it builds better relationships between players and a willingness to help rather than harm. The 9 wicket court is a smaller than "regulation" but offers a great court to perfect break play. Bob: I am sending along a couple shots taken on our new 9 wicket court. It’s based on the courts at the Claremont Hotel, Southwest Harbor, Maine. Size is small, 30 X 60, giving our players a chance to do some scoring on the undulating Celebration grass turf installed adjacent to our pavilion. On the other side of the pavilion are our four 3/4 courts used for GC and 6 wicket. We had both Bill Mead and Danny Huneycutt here last weekend and a clinic on combination of 6 and 9 wicket. The clinic was more complex than not for the 9 wicket “newbies” but the shot portion of the clinic was helpful for both.